Based on the number of reviews posted, and assuming that a relatively constant percentage of readers review books, there was a substantial increase in readership from 2013 to 2014 (47%). This does not support the belief that e-book readership has plateaued - indeed it implies that e-book adoption continues apace. Indies continued to make incremental gains in both titles in the top 100, and in readership (about a 40% increase in each). The Big Five Trads seem to have lost some considerable ground (17 fewer titles in the Top 100) to smaller Trads (up 10 titles) and Indies (up 7 titles). Readership for the Big Five was up 18%, while it was up over 300% for smaller Trads and 40% for Indies. Hachette and Random House lost the most ground, relatively speaking. The Big Five still predominate at the top of the list, but the smaller Trads made big inroads in all four quartiles, in both titles and readership . Indies have come to dominate the bottom quartile now, though they have some representation in the higher ranks as well. There is some evidence that the Power Law function flattened between 2013 and 2014, that is it was less hit-driven. It is worth noting that the top book of 2014 did not stand out from the pack in nearly the same way that it did in 2013. The proportion of women writers slipped a bit from 2013 to 2014, with most of that slippage being in the Big Five Trads. However, females had more readers per title than males. Indie writers in the Top 100 were mostly female in 2013, but in 2014 they were exclusively female. The Big Five Trads appear to be following a two track pricing strategy, aiming to dominate the high end and competing ferociously in the low end. Their readership was up substantially in those price ranges, but collapsed in the middle price range. Indies continue to sell at lower price points. Though smaller Trads were more evenly spread out, a case could be made that publishers are deserting the middle ground. Perhaps this is further evidence in favor of Thomas Piketty's thesis of the disappearing middle class, being played out on a smaller scale. The most popular Kindle books are still almost exclusively fiction, Indie or Trad. This held true in 2014 and 2015. Readership growth was about the same in both groups, when expressed as a year over year percentage. The highest selling Indies were almost all in the Romance category, in 2014. The Big Five Trads, on the other hand, lost ground in the Romance category. Trads still dominate Thrillers and Literary Fiction. Readership for Literary Fiction was up dramatically. Thrilller/Suspense also saw good gains, while Romance lagged overall. Recently, Amazon released lists of its 100 top selling new titles for 2014. Last year, I analyzed the 2013 list, so this year I will do the same. I will also compare and contrast the two lists, to see what has changed from then until now. In this blog, I will be looking at Amazon Kindle sales, as best as we can estimate that number. We have to estimate sales numbers via some other measure, since Amazon doesn’t actually list sales, just sales rank. The measure to which we do have access is the number of reviews that a book received. We will use that number to estimate sales, assuming that a fairly constant proportion of purchasers eventually review books. Therefore, the estimated sales will be the number of reviews divided by the proportion that we use to estimate reviews per hundred sales. For example, if a book had 500 reviews and we estimated that 0.5% of purchasers became reviewers (one out of every 200 readers), then the sales estimate would be 500/.005 = 100,000. That’s the constant I will use in this blog (one review per 200 readers), though it could well be higher or lower. Since the main purpose of the blog is to compare year over year trends and to examine results by category (e.g. Trads vs Indies), the absolute numbers (while they would be nice to know) are less important than the comparatives. So, what is my basis for this 1 in 200 reviews to readers ratio? Personal experience from Dodecahedron Books, where the proportion of reviews to sales seems to hang about the low percentage range. An analysis of Joe Konrath’s sales figures (that he thoughtfully provided on his blog last year) comparing his sales to the number of reviews posted on Amazon for those books this week. It turns out that the reviews to sales percentage was about 0.3% on average for all titles, which evidently included a fairly large proportion of free downloads. For the titles that sold at higher price points (calculated by taking dollars and dividing by sales), the reviews to sales proportion was more like about 1%. On the various blogs that I have read, the figures of 0.5% (one in 200) to 1% (one in 100) seem to be pretty typical reports by self-publishers (for example, Kindleboards has had several threads on the subject, which tend towards the 1% figure for paid downloads). Using the top selling book in the Top 100 Kindle books (Grisham’s Gray Mountain), these proportions seem reasonable, about 1.3 million copies sold and about $12.8 million revenue (at the posted price of $9.99). For detailed information on the categorizations of “Trad” vs “Indie” publishers, see Part 1 of this series of blogs. Basically, Traditional publishers (Trads) are large or mid-sized corporations while Indies are very small publishers or self-publishers. Let’s look at some results. Perhaps the most interesting result is that the number of reviews that readers submitted for books in the Amazon Top 100 increased substantially from 2013 to 2014 (up 47%). There has been a lot of talk about e-book readership plateauing, but from this data that doesn’t seem to be the case. People appear to be increasing their consumption of e-books. Though this only compares the top 100 books from year to year, given the power law nature of book sales, this would likely be true for books farther down the list, as well. As we can see, the big publishing houses (BPH) had a significant fall-off in numbers of titles in the Top 100, from 2013 to 2014 (-23%). However, they increased their numbers of reviews, and of course their imputed readership (18%). The smaller Trads (BPH-S) more than doubled their share of the titles in the top 100 and more than tripled their readership, as estimated by review. Indies increased their number of titles in the list and their readership proportionately, at about 40%. In terms of individual publishing companies, it would appear that Hachette and Random House lost readership, while Simon and Shuster was about even and Penguin and Harper Collins gained. In the smaller traditional publisher category, the big winner was Amazon, via its several imprints. This data might shed a bit more light on some of the underlying dynamics of the Hachette-Amazon negotiations of the past year. The tables below shows how well each publisher type did, by ranking quartile. Generally speaking, readership was up about the same amount in Quartiles 1, 2 and 4 (about 30%-40%). Quartile 3 showed a larger gain, nearly doubling. That would imply that there was some gain in readership further down the distribution, for a somewhat flatter power law. This supports the theory that the increasing access to books is leading to an increasingly flat power law in the market – i.e. not so “hit driven”. There was a lot of variability among the publisher types when looking at year to year readership by quartile; no strong trend seems to be visible. 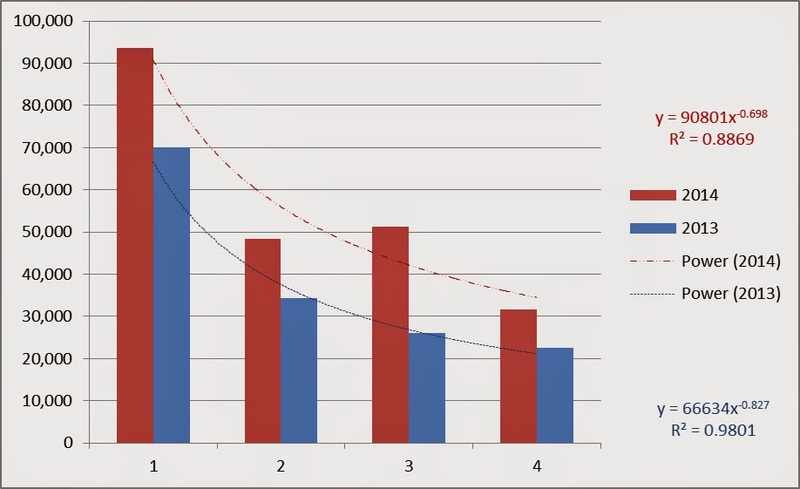 Note that the red line has a less steep slope than the blue line (the smaller exponent in the functional form in the red equation in the upper region of the graph indicates this – it isn’t easy to see by eye). Looking at the gender of the writers, we see that female writers continued to make up the majority of writers in the Amazon Top 100, though they fell from 70% of the total in 2013 to 64% in 2014. Though the number of titles written by females went down (-9%), their readership was up substantially (43%). Males had a 20% increase in titles and a 52% increase in readership. Readers per title were up for both males (up 27%) and females (56%). So, as you can see, though females slipped a bit in the number of books in the top 100, they increased their readership per book substantially more than male writers did.